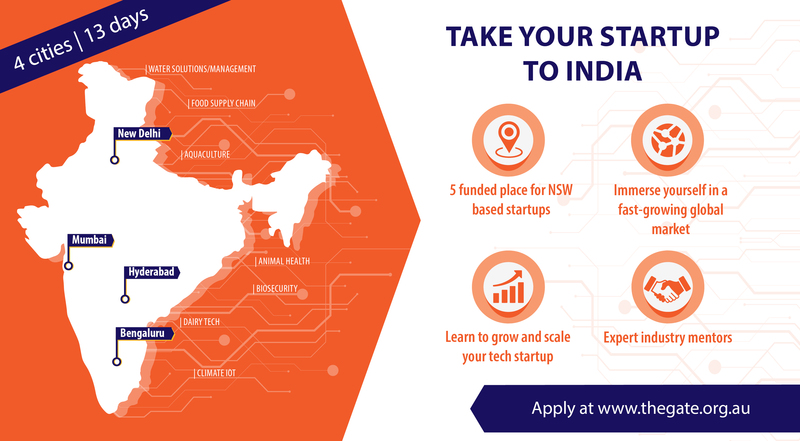 The NSW Government is offering 5 funded places for early stage ag-tech entrepreneurs from across NSW to be immersed in India’s fast-growing ag-tech startup ecosystem. This intensive immersion program will visit 4 Indian cities and 20+ companies over 13 action packed days – an outstanding entrepreneurial experience. Across its commercial hubs, India is home to a vibrant start-up community-the second largest in the world-and a widely entrepreneurial culture. India's flourishing start-up ecosystem is supported by a range of generous national and state sponsorship initiatives including Startup India; the government's flagship startup initiative. Technology startups comprise a large portion of the pool, with almost 5,000 registered in 2016. India is also home to a rapidly expanding consumer class, with an economy based on consumption and experiencing rapid and continued growth. Founders with an early stage, scalable global ag-tech startup that will benefit from exposure to the India market. The focus is ag-tech covering but not limited too – increased production, supply chain, water usage. The chosen start-ups will provide wide ranging benefits to the Agricultural sector. Applicants must submit an EOI form to provide essential information about their company and responding to the selection criteria. The application deadline is 31st May 2019. Selected applicants will be notified on 28th June 2019 and will be invited to give a 10-min presentation (5-min pitch followed by 5-min of questions) at The GATE in front of a panel of Ag-tech experts and entrepreneurs.